U.S. Coast Guard 17th District Alaska Dec 1, 2018. A Coast Guard Air Station Kodiak MH-60 Jayhawk helicopter crew sits on the ground in Nome after recovering two stranded hunters from the Punuk Islands, near St. Lawrence Island. U.S. Coast Guard photo by Lt. Daniel Beshoar. 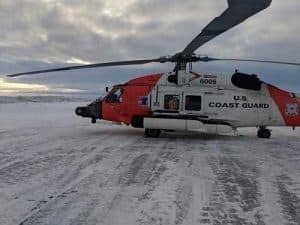 KODIAK, Alaska – A Coast Guard Air Station Kodiak MH-60 Jayhawk helicopter crew rescued two stranded hunters on the Punuk Islands, east of St. Lawrence Island, 664 miles Northwest of Kodiak, Alaska, Thursday. After the aircrew’s roughly 700-mile transit, the men were taken to Nome for further care. One of the men was reported to have been ill for several days, and they had very limited communication devices on hand. Wednesday, District 17 Command Center watchstanders and RCC Anchorage received an agency assist request from the Alaska State Troopers for two Savoonga male hunters reported to have been stranded after transiting to the Punuk Islands by small boat on Nov. 21. Using a VHF-FM handheld radio, the men were able to hail a Ravn Alaska Aircraft flying overhead and relayed that they were in distress. The men reported that their boat motor was inoperative, therefore leaving them with no means of transportation back to their snow machine on St. Lawrence Island. Ravn Alaska notified RCC Anchorage, who then deployed the 212th Rescue Squadron pararescuemen via a 211th Rescue Squadron HC-130 to assess the condition of the men, drop survival gear to them and provide medical assistance as needed. District 17 Command Center assumed mission control and directed the launch of an Air Station Kodiak MH-60 Jayhawk helicopter aircrew, along with the Coast Guard Cutter Alex Haley with an MH-65 Dolphin helicopter embarked, to aid in the rescue. After transiting approximately 1,000 miles total, the MH-60 Jayhawk aircrew found both men and transported them both to Nome for further assistance. Weather on scene was freezing spray, 14-foot seas, gale-force winds and blowing snow.